Risk appetite is positive for bitcoin. If the S&P 500 made a 2.5 standard deviation move [as it has done year-to-date] and investors are looking for vol [volatility] that?s building a base case for bitcoin. 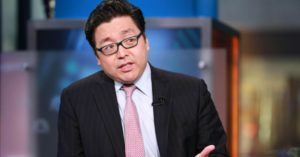 Lee, known for making BTC price forecasts believes Bitcoin will top $10,000 sometime in 2019. Earlier in April, Lee made the case for Bitcoin?s fair value amounting to about $14,000 based on the present mining cost. Travis Kling of Ikigai Asset Management recently espoused similar views, calling central bank policies more politicized. Thus, more people are choosing to employ Bitcoin as a hedge against the uncertainties of ?irresponsible? monetary policies. It?s a matter of education, realistically speaking, the average person on the street doesn?t know much about blockchain technology, but that?s no different from Internet-related stocks in the late ?90s. Do you think Bitcoin has entered another bullish cycle" Share your thoughts with us in the comments below.